I love making bread. Over the past few years, it has gradually become part of my weekly kitchen routine. My bread strategy is firmly in the “no knead” territory, making it long on rising time but super short on effort. 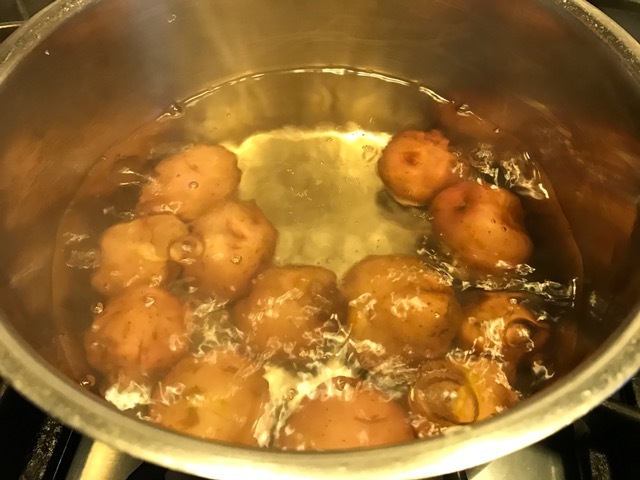 Initially, I was hooked by the Jim Lahey recipe made popular by Mark Bittman. Last summer, on a trip to Vermont, I couldn’t resist a detour to the King Arthur Store, where I bought a sourdough starter. That sparked a new avenue of bread experiments. 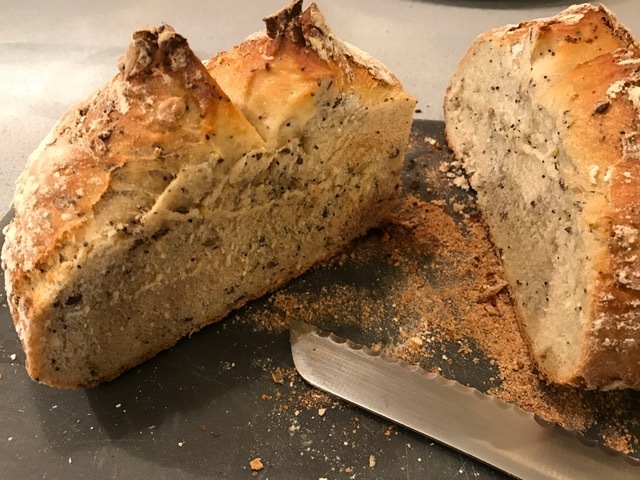 This week’s recipe for Cook the Book Fridays is David Lebovitz’s Multigrain Bread, which resembles the loaves he buys in Paris. This loaf is neither no-knead nor slow-rising, but I always like learning new things, so gave it a try. #1 It’s relatively fast. I mixed up the starter right before bedtime. 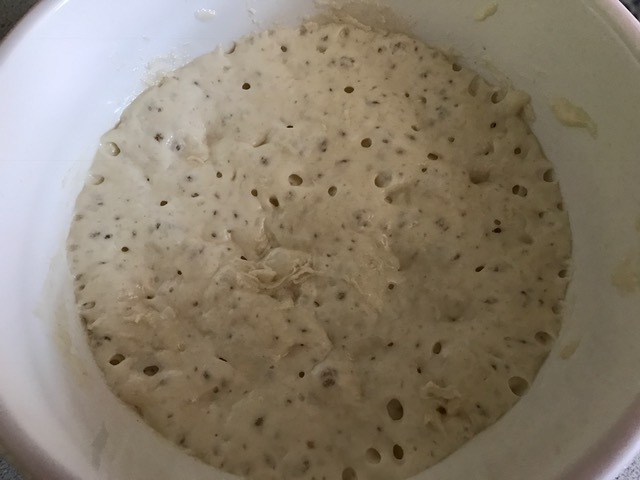 Initially it looked unpromising, but overnight the starter rose into a bubbly brew. 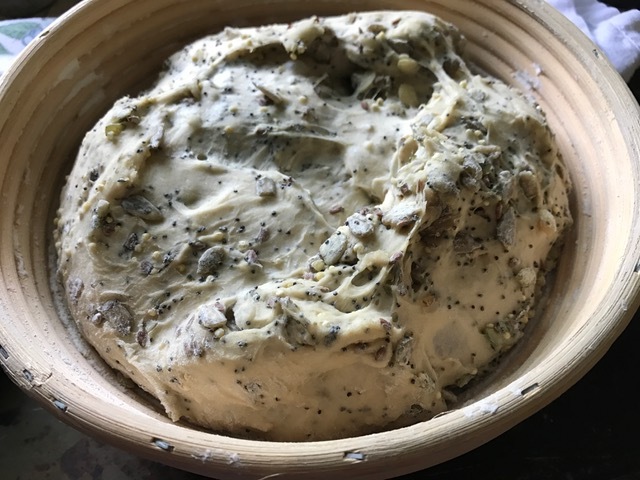 #2 The combination of seeds mixed into the dough was delicious. 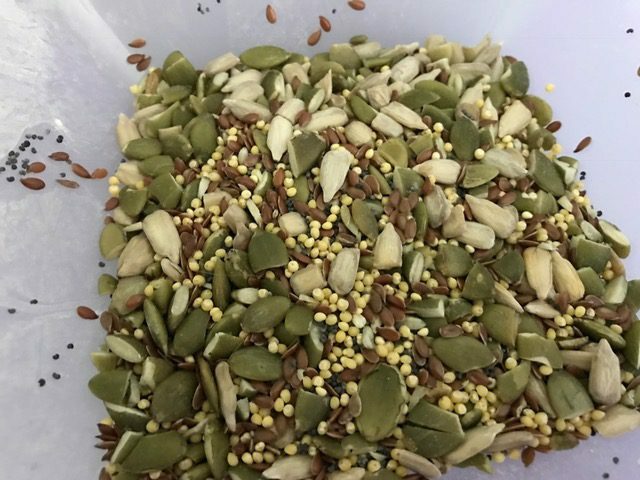 Flaxseed, millet, poppy seeds, sunflower seeds, and chopped pumpkin seeds. Yum! #3 As with my usual routine, this loaf is baked in a Dutch oven (I used a stoneware bread dome) which produces a perfect artisan-like crust. #4 The technique for scoring the top of the loaf with a pair of scissors was easy, attractive, and effective. I’ll be reusing this new trick on future loaves. On the other hand, I question the recipe’s name. Multigrain? It’s made with mostly bread flour with a small amount of whole wheat. That’s two grains, but in my book, that’s hardly multigrain. Maybe he meant to call it Multiseed Bread? 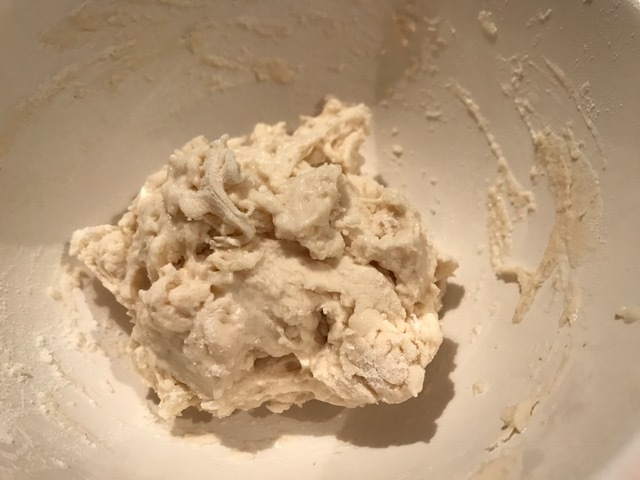 This plain bread dough was easy enough to knead because I let the stand mixer do the work. After I added the seeds, the dough wasn’t quite sticky enough to absorb them. I ended up adding a few tablespoons of water which helped. 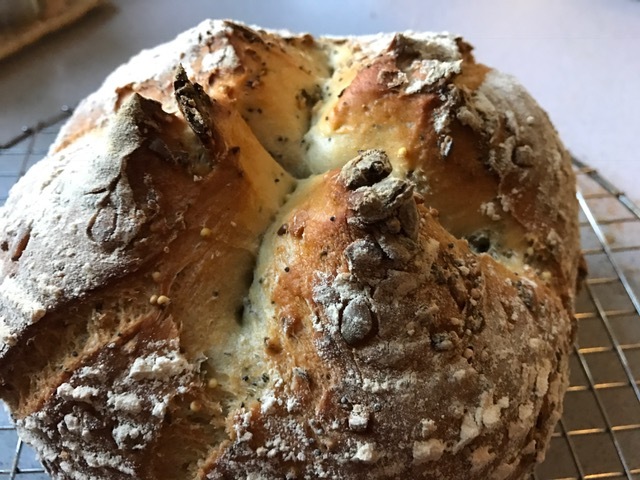 I would recommend adding the seeds when the other ingredients are added to the starter and knead it all in one go. I typically bake a loaf this size at 500F for one hour (in a preheated bread dome). I questioned the directions for 30 minutes at 450F. In previously recipes from My Paris Kitchen, I’ve noticed that extra baking time is often required. My oven must run cooler than David’s. I opted to set the oven temp to 500F. After 30 minutes, it was not done. I let it go another 15 minutes. The internal temperature said it was done, though I might have liked a darker crust. In the end, I liked this bread. 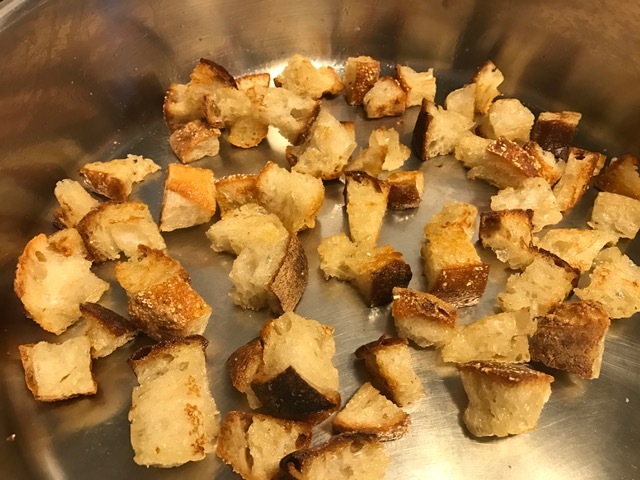 It had a nice crumb and toasts well. Would I make it again? Perhaps if I didn’t have the time to make my usual favorites. I really enjoyed the seed mixture so I’ll try adding that combo to a no-knead or sourdough loaf in the future. Lots of lessons learned with this recipe. 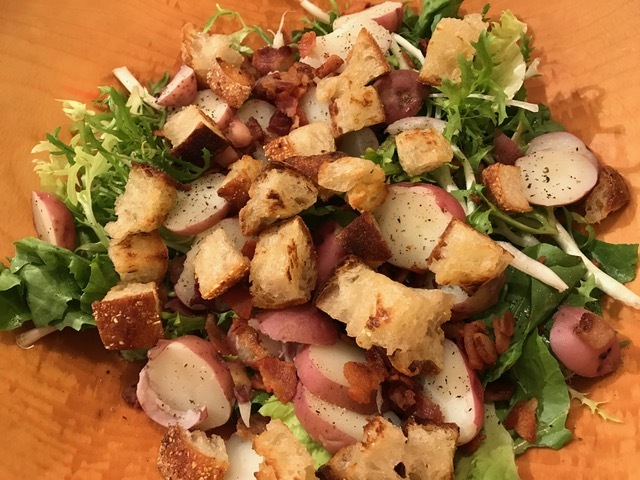 To see what other members of Cook the Book Fridays thought of this recipe, check out their links here. 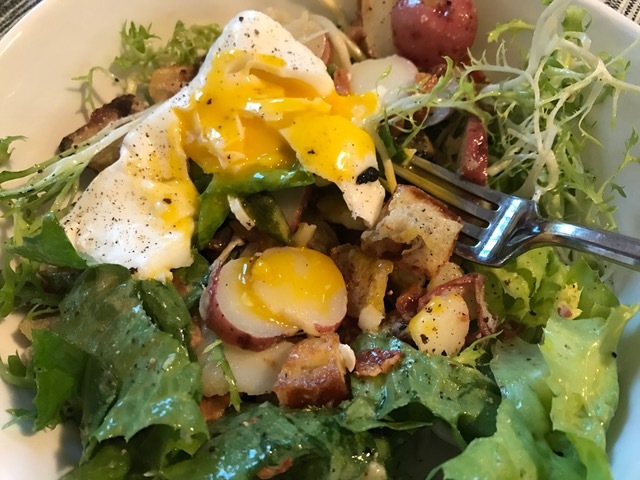 You can find the recipe here at Fine Cooking or on page 241 of David Lebovitz’s My Paris Kitchen.